Michelle has been saying lately that she wants to bake me a cake for my birthday this year . Last year, I made Michelle a black forest cake for her birthday, and this year I made her a chocolate cake, so I think she feels pressured to reciprocate. Plus, she practically forgot my 30th birthday last year, so that may be a factor too? But anyways, I’ve been telling her that she can’t expect to get it perfect on her first attempt, so maybe it would be a good idea to practice a couple times beforehand… I’m no expert either (as you can see from the photos in the preceding links), but I knew I could still offer enough advice and instruction to set her up for success, if she does indeed decide to bake me cake this year. 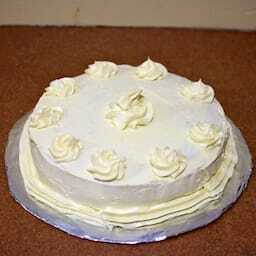 Lemon cake with strawberry filling and lemon buttercream. At the same time, while waiting for the cake (and filling) to cool, I walked Michelle through making a pizza. We bought pizza dough from the grocery store, but everything else was from scratch. 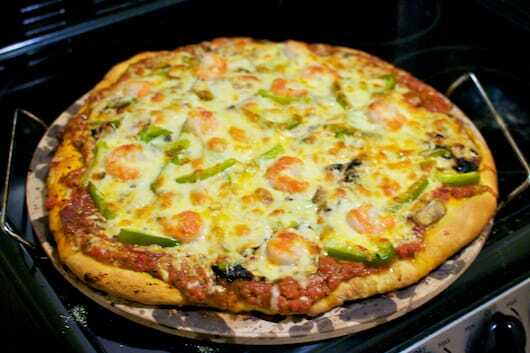 Toppings: basil-tomato sauce, pepperoni, green pepper, mushrooms, black olives, shrimp, mozzarella, asiago cheese. Michelle’s Cake (and Pizza) was published on Monday, September 12, 2011 at 5:48pm EDT by Daniel Menjívar and last updated on April 11, 2018 at 9:30pm UTC .